The team came in with a goal for solid points and getting out of round 1 safe and healthy. If they got on the podium, that would be a bonus at the beginning of such a long series. They certainly got more than they bargained for, although nobody on the squad was surprised. They have all put in the necessary work to get there and the results are a product of that effort. Jason Anderson is definitely not afraid of hard work. While he is a fun and happy kid off the track, he wants to win races and championships. A rookie in the 450 class a year ago, he landed on the podium at A1 followed by some expected struggles associated with the first season on big bikes. Growing pains that all riders experience. That was a much different podium and now a different rider. With a good start last year, he hung on for 2nd, this year, he was the fastest rider on the track and was not going to be kept from the top step. Jason had a huge crash in practice 1 and was only able to muster a tenth place qualifying time in the second outing. The crazy thing was how close he was chronologically. Sitting in 10th he was less than a second behind the fastest time. In fact the field was only separated by 2 seconds all the way back to 19th. The signs pointed to needing a good start in that situation and the tenth gate pick certainly doesn't help. Anderson made it work. Not necessarily with his start, but with his riding after the first turn. On a track that everyone is going fast on, passes should be tough. Jason made it all the way from 9th to 2nd in the short 6 lap heat race. That gave him a much better gate pick for the main which he made the best of. He was immediately battling for the lead until an unfortunate red flag waived for a full restart. JA did not fair nearly as well in the second gate drop. He actually rounded the second turn in 10th position. At that point it looked like a chance at a win was all but out of the cards. You can never count him out however; a podium was still possible. All of the guys in front of Jason were championship caliber riders so it was going to be tough. Then something incredible began to unfold. The #21 was clearly the fastest rider on the track, making excellent passes one after another with no need to really be patient. Suddenly he was in 2nd and closing fast on the leader. He made the pass for the lead with an amazing six laps to go, then simply pulled away. As the race neared the end he was 8 seconds ahead before cruising the final lap to his first career 450 win and the first one for Husqvarna. It may be too early to say after just one round, but Jason Anderson looked like the guy to beat in 2016 in Anaheim. 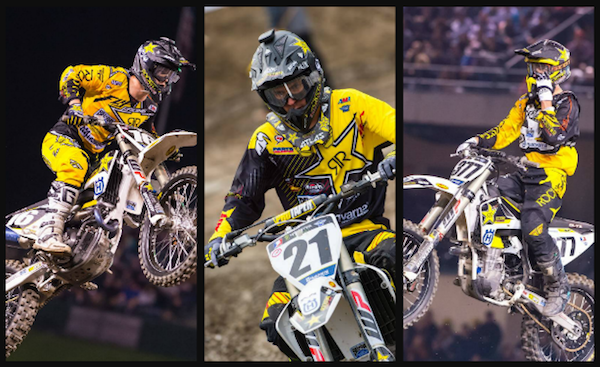 Jason Anderson: "Tonight at Anaheim 1 was…..pretty awesome! I got a decent start in the first gate drop and then they restarted it and I was like dang it! In the second one I got a mediocre start and I just moved forward, I'm so pumped! The guys I was passing were waxing me last year so to even be battling with them was a cool deal." Zach Osborne had a much better day in practice, battling for the top time in both P1 and P2 before settling into the 2nd place qualifying position. When the smoke from the fireworks cleared and the gate dropped for the first heat race of 2016, Osborne moved into the lead and secured his first career heat win. He kept his head in the main event, riding his FC 250 into the 3rd position where he stayed until the end, securing a solid podium finish. Christophe Pourcel has not lined up for an AMA Supercross in several years. After returning to racing in the US in 2014 on a 250, he signed with the team for the Outdoor Motocross Championship last year. His results were solid and he was signed to a 2 year deal to contest both disciplines. He didn't look too rusty when he recorded the fastest time in the second practice. Unfortunately he was unable to transfer out of his heat and was forced into a semi. He didn't get a great start but moved forward to secure the final qualifying spot, successfully avoiding the treacherous LCQ. This didn't give him a great gate pick in the main, but just like his teammate, he made it work. Sitting just behind Anderson early in the 5th position prior to the restart. He fared much worse in the second try, being hit in the first turn and pushed outside the tuff blocks. Pourcel found himself well in the back. Christophe Pourcel: "First Supercross race back after a long time. In the main there was a red flag that didn't help because I was in a good position from not the best gate pick. The restart I got pushed off the track. We are here to learn and I know I have the speed. Jason [Anderson] is riding good, he won tonight and I can learn from him too. We will just keep pushing with the team and try to be with him in the top 5." Going into round two on a high, Anderson will look to carry the momentum and extend his hold on the red plate. Osborne will try to improve on his 3rd place performance and chip away at the small gap to first. Pourcel plans to take away the positives from round 1 and close on his goal for the top 5 in the first stop San Diego next week.